BBC Radio was hugely important to the burgeoning Rock scene in the mid to late 60’s, new and existing artists could have an outlet to have their music heard thanks to pioneering English rock DJ’s like Tony Blackburn, John Peel, and Tommy Vance. The recordings made by the BBC for their radio distribution would become some of the best “live” recordings from the period, acts like The Beatles, The Who, Cream, Jimi Hendrix, Pink Floyd, Queen, and Led Zeppelin all have compilations of this material on my shelves. The folks at Magic Bus now present a follow up to their two previous David Bowie box sets by offering up the enigmatic artists complete BBC recordings. The box has a similar layout to their previous efforts, a long box that houses four individual mini LP sleeves that are adorned with pictures from the era, song listing, recording and broadcast dates, sound engineers, and musicians on the recording. There is a 36 page booklet that provides the same information as the CD sleeves and a large two sided poster, a smaller promo postcard with a handwritten note of thanks to the BBC as a mini card with a caption stating this box set is limited to 500 copies. If there was ever one drawback from the officially released recordings, it is certainly the completeness of them, for most bands, one must look further into the underground markets or trade circles to get the complete picture, the same can be said of Bowie’s output, Bowie At The Beeb was released in 2000 and did provide a nice overview of this material, now it can be used as appetizer for the main meal. 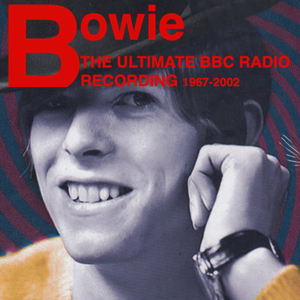 The earliest Bowie recording at the BBC finds him playing material from his first, self titled debut, the Top Gear recording from December 1967 is of excellent quality and features Bowie accompanied by the Arthur Greenslade Orchestra. Love You Till Tuesday was featured on the 1988 Bowie At The Beeb set of three BBC Transcription Services (Cat. No. CN5155/S), the music does have a Broadway feel to it, with a bit of swinging London mixed in. The second Top Gear recordings, tracks 6-10, are a step towards a bit more rock with some really nice guitar playing from guitarist extraordinaire John McLaughlin. Four of the songs, minus When I’m Five, appeared on the Bowie At The Beeb complication CD. In The Heat Of The Morning was on the 1988 Bowie At The Beeb set of three BBC Transcription Services (Cat. No. CN5155/S). Like the previous session, the quality is excellent and the Tony Visconti Orchestra backing musicians work much better for Bowie. The remaining three songs plus interview from the Lee Travis show are again, excellent quality. Compared to the previous songs, he is accompanied by a four piece band Juniors Eyes featuring Tim Renwick who most Floyd aficionados are familiar with. The change in sound is also striking, gone is the pseudo Broadway inspiration and now Bowie is playing rock and roll. Let Me Sit Beside You and Janine both appeared on the Bowie At The Beeb compilation CD, Let Me Sleep Beside You was on the 1988 Bowie At The Beeb set of three BBC Transcription Services (Cat. No. CN5155/S), and all three songs plus interview were on the BBC Transcription Services Top Of The Pops 261 Week 48 (Cat No CN 125078). 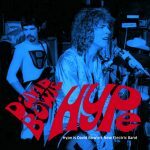 Bowie gets an hour long show for John Peel, this recording finds David backed by “The Hype”, Tony Visconti on bass and the great Mick Ronson on guitar. The recording featured here is just shy of excellent and is a notch below the previous disc as the original master was lost by the BBC. I’m Waiting For The Man was recorded between Fill Your Heart and The Prettiest Star but was cut due to time restrictions, Memory Of A Free Festival fades at about 3:15, although the song would track at over 6 minutes, it was also edited due to time. The feeling one gets from this recording is live in the studio performance with interviews edited separately. Amsterdam, God Knows I’m Good, The Width Of A Circle, Unwashed And Somewhat Slightly Dazed, Cygnet Committee, and Memory Of A Free Festival all appeared on the Bowie At The Beeb compilation CD. Obviously influenced by the hard rock scene, Bowie assembles a band who can get the job done, the addition of Mick Ronson on guitar allows David to move his music into yet another direction, the results would find him settling on a core group of musicians who would record his second LP, The Man Who Sold The World. The back cover with Bowie with some interesting right eye makeup in a mime pose is striking. The Sounds Of The 70’s with Andy Ferris takes place just prior to the recording of The Man Who Sold The World, again Bowie is backed by The Hype, the sound is excellent and quite heavy. The Wild Eyed Boy From Freecloud was on the Bowie At The Beeb compilation CD and on the 1988 Bowie At The Beeb set of three BBC Transcription Services (Cat. No. CN5155/S), The Supermen was not originally part of the broadcast and appeared in 2016 on the limited edition 4 LP Bowie At The Beeb LP. A stunning performance that sounds simply incredible and when turned up really gets the floor shaking, the early short version of The Width Of A Circle loses none of its primitive force. John Peel gets the first BBC recordings featuring the Spiders From Mars, Ronson on guitar, Trevor Bolder on bass, and Mick Woodmansey on drums, the group is augmented by Marc Carr Pritchett on guitar, Dana Gillespie and Geoff Alexander on vocals. The master recording of this session is also missing from the BBC archives, unlike the Feb 1970 recording, this one has excellent sound quality, very powerful. Four songs would be used for the Bowie At The Been compilation CD, Bombers, Looking For A Friend, Almost Grown, Kooks and It Ain’t Easy, while Bombers, Looking For A Friend, Almost Grown, and Kooks were on the 1988 Bowie At The Beeb set of three BBC Transcription Services (Cat. No. CN5155/S). It has been a year since Bowie did anything for the BBC, the time was spent working on touring and writing material that would be on the as of yet unreleased Hunky Dory. The session is quite interesting with mostly new music as well as a great take on Chuck Berry’s Almost Grown that allows the band to rock out. Bowie was also producing singer / actress Dana Gillespie and the two had a rare promo record released featuring songs from both artist, collectors can find it on Make Way For The Rock And Rollers (The Godfatherecords G.R. 953), she makes an appearance here as well providing vocals on Andy Warhol. A very intimate and fun session showing David giving and taking musical inspiration from others as he progresses down his unique musical path. The interviews and interaction with John Peel are sincere and once again one can tell Peel’s enjoyment of the music and artists alike. The Supermen and Eight Line Poem appeared on the official Bowie At The Beeb compilation CD, Oh! You Pretty Things first appeared on the Japan only version as well as the 2016 limited edition 4 LP Bowie At The Beeb LP. The Supermen was not originally broadcast and did appear on the Bowie At The Beeb set of three BBC Transcription Services (Cat. No. CN5155/S). Excellent “Unplugged” performance by Bowie and his band, the recording is again excellent and has an intimate atmosphere to it, certainly due to the quiet nature of the material. That being said the music is simplistic being sparse yet full at the same time his version of Amsterdam being a standout, David has not lost his love of acoustic folk music. John Peel meets Ziggy Stardust, the January 11, 1972 material is from a very good broadcast as the original recording is sadly lost from the BBC Archives. The recording is clear and detailed but lacks any range of frequencies and has the radio hum sound to it, it is nonetheless exciting to hear. This is probably the rarest of the material on this set and has only been found previously on bootlegs. Bob Harris get the full Ziggy treatment in a late January 1972 session, such is the quality of the recording it was featured in complete form on the Bowie At The Beeb official CD collection. Ziggy Stardust and Five Years were on the Bowie At The Beeb set of three BBC Transcription Services (Cat. No. CN5155/S). The recording is excellent quality, so vivid when you turn it up sounds as if the Spiders are in your living room, the best damn 20 minutes of rock and roll you will hear anywhere. The mini LP sleeve is great, the cover has David in Egyptian garb and the back cover is a live shot with David looking like a punk rock 50’s rock and roller…superb! Ziggy reigns supreme! The John Peel May 1972 complete session was featured on the official Bowie At The Beeb compilation CD, White Light / White Heat was featured on the Bowie At The Beeb set of three BBC Transcription Services (Cat. No. CN5155/S). White Light / White Heat is an excellent opening song, very powerful, the band is very tight with superb playing. Mick Ronson has an insane tone to his guitar, just a hint of fuzz, really powerful performance. The coverage from the BBC radio just added fuel to the rapidly growing fire as it seems like Bowie exploded in England in 1972, after repeated listening’s, the BBC recordings done during this period is some of the strongest the band would do. The Johnnie Walker session would be released in full on the official Bowie At The Beeb compilation CD, Starman would be played extensively by Walker as his “single” of the week, the song would also be on the Bowie At The Beeb set of three BBC Transcription Services (Cat. No. CN5155/S). The song would get an extra push when the band played on Top Of The Pops in early July 1972, curiously played during this session with his first hit single from 1969’s Space Oddity, done semi acoustic as they were performing it on tour. As with the previous session, the quality is superb. Bob Harris gets the last Bowie session for close to 20 years, for good reason as after Bowie shed his Ziggy persona he would leave for a base of creativity in America. His fame fully realized, he no longer needed to cater to the music media. The complete session minus White Light would be on the official Bowie At The Beeb compilation CD, Rock ‘N’ Roll Suicide would be on the Bowie At The Beeb set of three BBC Transcription Services (Cat. No. CN5155/S). Superb sound with David doing a great version of Andy Warhol that has him improvising some lyric as if commenting on it. This session sounds like the band are tiring of the grind, the music is well played yet does not bristle with energy like the previous 72 sessions do. 19 years seems like an eternity, yet David makes his return to the BBC, this time as part of a band, Tin Machine. Formed with guitarist Reeves Gabrels and rhythm section of Tony and Hunt Sales, sons of Soupy (I don’t like talking chairs) Sales, the band sported a harder rock style than Bowie’s previous endeavors. Their evening session done for Mark Goodier’s features four songs from their second record, Tin Machine II and one sole track, Heaven’s In Here from their debut. The sound quality is excellent, the band sound loose and the playing is superb, Gabrels is on fire throughout with Stateside being a standout track, Bowie singing electric blues. 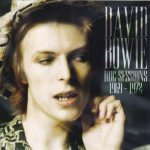 This session was recorded during rehearsals for David’s 50th birthday party at Studio Instrumental Rental Studios in New York City. The sound quality is excellent, the intro is birthday wishes from numerous musicians involved with the birthday party at Madison Square Gardens on January 9, 1997. Bowie kept his band simple, Gabrels on guitar, Gail Ann Dorsey on vocals and bass, Mike Garson on keys and Zach Alford on drums. The title of the session, ChangesnowBowie is like a mission statement as the band goes through an early 70’s deep tracks set. The Man Who Sold The World has Reeves playing it with a Far East twang that is great. Cool to hear a couple Tin Machine songs, Shopping for Girls and I Can’t Read sound fresh, but the song of the set goes to Repetition from Lodger, given ample acoustic version. The interviews feature more Birthday Wishes and questions from fans with David giving sometimes candid but mostly coy answers and the whole things is a fun listen. David on the Mark and Lard show, live in Studio 4 Maida Vale, Delaware Road in London playing live in front of a small audience that included Bowie’s son, Duncan and Geoff McCormack. The Mark and Lard segments are a bit annoying, but David does give a bit of background and the musical performances are superlative. Bowie goes very deep for this set, Drive-In Saturday from Aladdin Sane! Can’t Help Thinking About Me is a 1965 song most notably for being the first to be credited to Bowie and not his surname Jones. The band rejuvenate the song, the band give a ripping version with the chorus bearing a striking resemblance to the original. Repetition from Lodger gets a traditional performance, again a really enjoyable session in superb quality. The Billy Bragg segment comes just after Bowie performed at NetAid in October 1999, they have a casual conversation about his career and there are some studio tracks intertwined in the 20 minute interview. Bowie seems more at ease with a fellow musician versus the comedic DJ and interviewer. Bowie then performs Survive and China Girl live in Studio 4 Maida Vale. Both songs are lush sounding and superbly played, and the sound quality is excellent. David’s final session for the BBC took place in Studio 3 Maida Vale in front a specially invited audience of 100, the event featured an introduction by DJ Jonathan Ross and has Bowie again playing a diverse set of music featuring songs from his most recent record, Heathen as well as a few golden oldies. I really enjoy the Heathen music, Sunday and Cactus blend well with Look Back In Anger (Lodger) and Alabama Song, then goes really deep with Bewlay Brothers from Hunky Dory. A very well paced and played hour of music and words from David, in superb quality. An incredible collection of material, the sound quality is superb and the packaging and presentation is excellent. Much of this material I have not heard before and the 1999-2002 being a very enjoyable segment of the set. Bowie seems at ease with his artistic legacy and his popularity. Simply an essential collection for Bowie fans, all the BBC Sessions lovingly complied in one massive set. This review took some time, but the individual CD’s have been in and out of my system since I received the set, and I foresee several remaining on my “playlist” for sometime.